In response to multiple requests, we have added the full text of the top selling CompTIA Security+: Get Certified Get Ahead: SY0-401 Study Guide in a full Security+ course. This course includes all of the multiple-choice practice test questions, performance-based questions, audio, and flashcards from the Security+ Full Access package but adds the text CompTIA Security+: Get Certified Get Ahead: SY0-401 Study Guide within an online course. 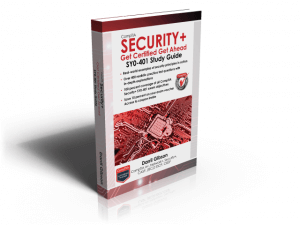 It includes the full text of the CompTIA Security+: Get Certified Get Ahead: SY0-401 Study Guide within an online course. Similarly, the text within the online are course are words on web pages. It is not a paperback book you can touch and feel. Get Certified Get Ahead: SY0-401 Study Guide . Here’s what people are saying about the CompTIA Security+: Get Certified Get Ahead: SY0-401 Study Guide and packages on this site. Random practice tests from the all of the practice test questions in the CompTIA Security+: Get Certified Get Ahead: SY0-401 Study Guide. All questions include explanations so you’ll know why the correct answers are correct, and why the incorrect answers are incorrect. See a demo here. Use these to reaffirm your understanding of the content in the book before taking the live exam. Eight sets of performance-based questions with multiple questions in each set. These questions help you understand and prepare for performance based questions. Two new sets of performance-based questions with a total of 37 questions. These new questions use a new testing engine that includes realistic drag and drop, matching, sorting, and fill in the blank questions. See a demo here. Questions include configuring firewall rules, RAID, ports, authentication, interpreting logs, and more. Extended access. Access the study materials for a total of 60 days because sometimes life happens. check out complementary study packages here. These online packages are just a few clicks away.